The staff here are amazingly helpful. At a time when customer service is not always what one would expect, the staff at Wyndham Grand take their work seriously and do so with a sincere smile. 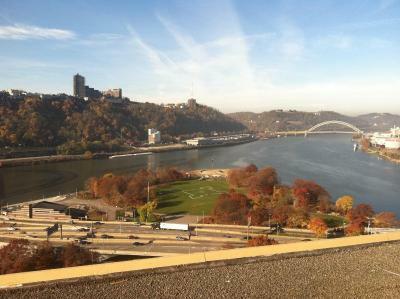 The location, as well, is hard to beat in terms of Point State Park, the stadiums and the downtown area. Breakfast: Too expensive for what you got. Hotel needs renovation BAD. Worn out place. Overall cost was way too much for what you received. Only good thing was Parking attendant was great. The staff at the Wyndham Grant Pittsburgh were incredible! My friend got ill during our stay and we had to cut our trip short to return home. Every single person working at the hotel - front desk, bell stand, valet - were so kind and incredibly helpful. I cannot say enough nice things about the staff at this hotel! Location was walking distance to Market Square and many restaurants. Breakfast was convenient and plentiful. The usual choices plus an omelette station. 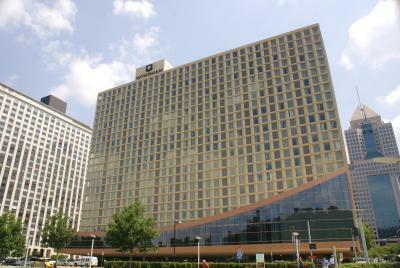 Beautiful hotel in a great location overlooking Point Park. We were in town for a college visit, and the location was so convenient -- walking distance to both the university and a lot of great places to eat. Room was comfortable, clean, and well-appointed. Staff was helpful, friendly and courteous. The hotel was very crowded -- there was an event for high school students there, and the place was quite full! In spite of that, our room was very quiet. We were pleasantly surprised that we never heard the students who were moving around on our floor! The location is fine and most of the staff was very helpful and friendly. Found a great deal for this place but would pay full price knowing how nice it is now! Staff was amazing and valet make our first tocthe trip amazing. The shuttle driver was very helpful and knowledgeable! Loved the pillows! 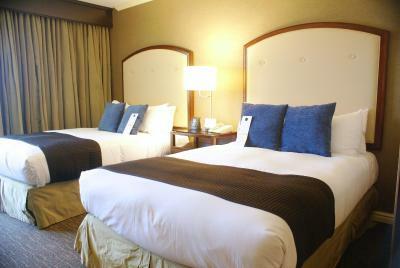 Staff was very friendly and our room was spotless. Thanks for a great night to celebrate our anniversary! I like how friendly the staff was and how helpful the valet men were. It was very convenient to be able to park and not have to worry about finding parking in the city. The location was also perfect. 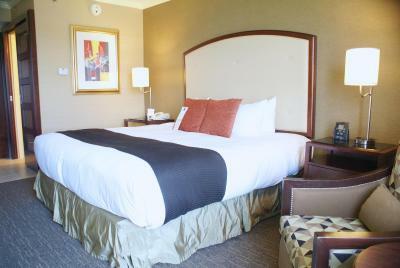 Wyndham Grand Pittsburgh This rating is a reflection of how the property compares to the industry standard when it comes to price, facilities and services available. It's based on a self-evaluation by the property. Use this rating to help choose your stay! 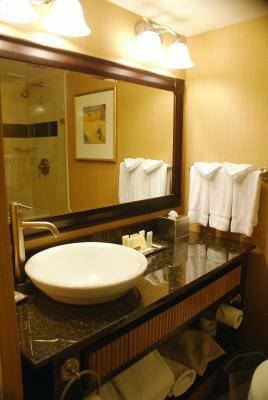 Located in the heart of Pittsburgh city center, this hotel features 2 full service bars and a restaurant. 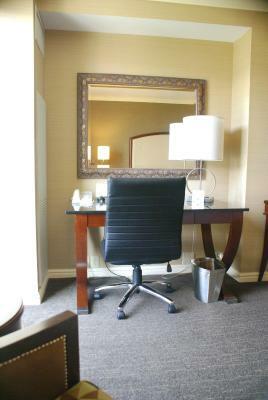 Free Wi-Fi is available in every guestroom. The Duquesne Incline is 0.7 mi away. 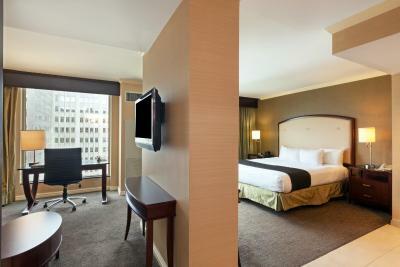 A flat-screen TV and an iPod docking station are featured in every room at the Wyndham Grand Pittsburgh. 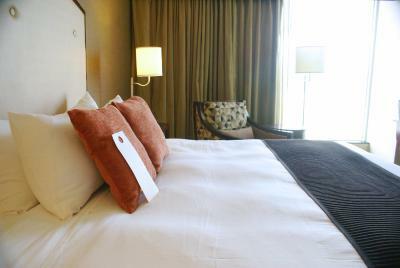 Decorated in beige and brown tones, the rooms also have coffee making facilities. 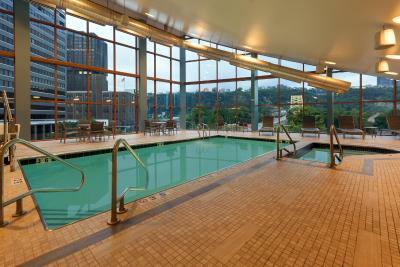 Work out in the 24-hour fitness center or visit the 24-hour business center at the Pittsburgh Wyndham Grand. 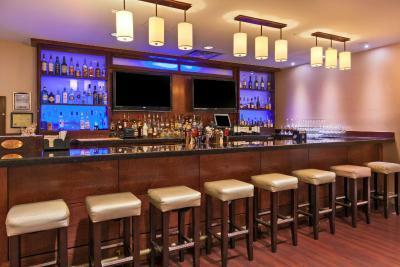 Guests can enjoy a cocktail at the Scenes Lobby Lounge and the Three Rivers Lounge. 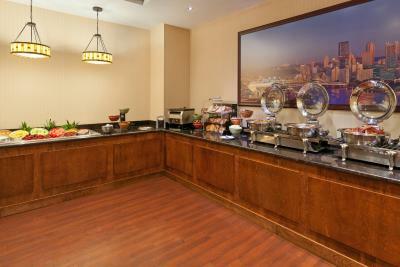 The Three Rivers Restaurant serves American cuisine for breakfast, lunch, and dinner. 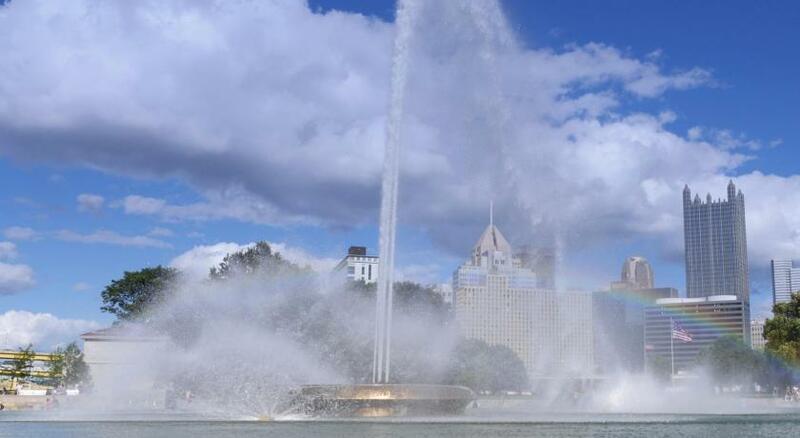 Point State Park is directly across from the hotel. 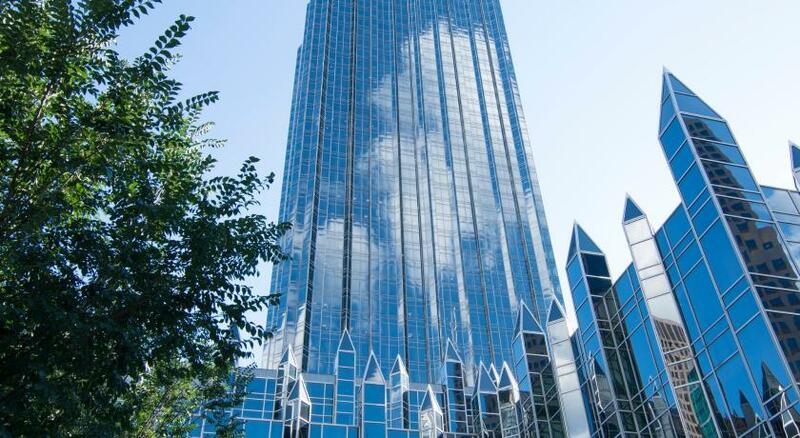 Both Heinz Field, home of the Pittsburgh Steelers and the Andy Warhol Museum are within 5 minutes’ drive. 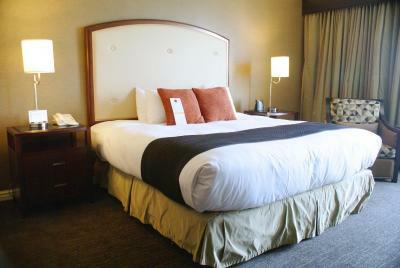 When would you like to stay at Wyndham Grand Pittsburgh? 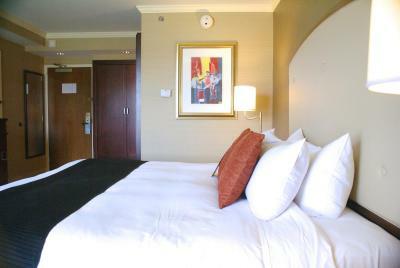 This double room has air conditioning, iPod dock and tea/coffee maker. 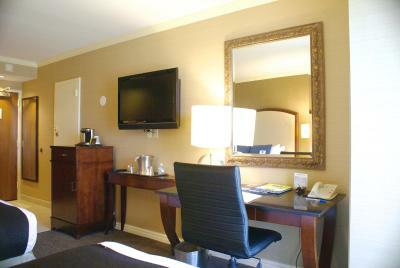 This suite features a tea/coffee maker, air conditioning and sofa. This double room has a iPod dock, air conditioning and tea/coffee maker. 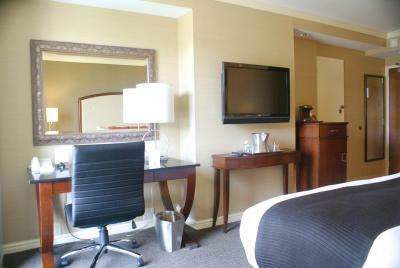 This suite has a sofa, iPod dock and air conditioning. 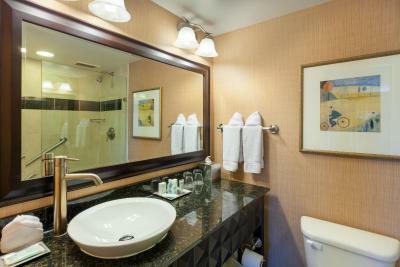 House Rules Wyndham Grand Pittsburgh takes special requests – add in the next step! 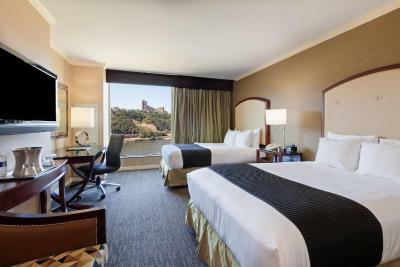 Wyndham Grand Pittsburgh accepts these cards and reserves the right to temporarily hold an amount prior to arrival. Please note, a security deposit of USD 100.00 is required upon arrival for incidentals if paying in cash. This deposit is fully refundable upon check-out and subject to a damage inspection of the accommodations. A security deposit of USD 50.00 is required upon arrival for incidentals if paying with a credit card. This deposit is fully refundable upon check-out and subject to a damage inspection of the accommodations. A full breakfast is available for an additional charge. Rates that include champagne and breakfast at the restaurant also include a 2 pm late check-out, valid for up to 2 guests. i booked this room approx. 4-5 months ahead of time and had forgotten that a breakfast was included. 1 week before arrival i received an email offering to upgrade, so i picked the breakfast buffet for 2 ppl @ $14.99 each. when i got to the hotel i now had 4 breakfast coupons, i explained i didnt need 4, there was only 2 of us, and the woman at the desk kept saying it doesnt matter we cant refund. i felt like this was a money making gimmick. Contemporary style. Location is killer!!!! The room in which I stayed was next to the stairwell and elevators, thus making for a noisy spot. Earplugs did the trick for a good night's sleep, though. Valet parking was spotty as there are a lot of people going in and out. More valets at high volume times. The valet parking service was expensive, and the wait was long to get our car. The non-valet options were not well-explained -- they told us to go around the corner to find a self-service lot, but because it was unattended, the pricing and security were unclear. We ended up paying the $35/day valet fee, which seemed steep, especially given that we had to retrieve the car by 1 PM on check-out day. The valet fee is a flat-rate and you can come and go as often as you choose, which is a silver-lining, but we checked-in at 6 PM and got our car by the 1 PM deadline the next day, so we paid $35 to park for less than 24 hours. 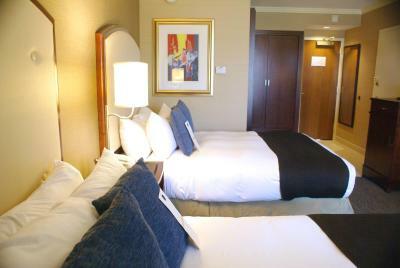 And if you were staying for several days, that fee adds a significant cost to the price of your stay. At busy times of day, there were long waits for the elevator (mostly due to the large groups of teens staying there). A nuisance, really, but good to know so you can plan extra time to get places. The room was very dusty, I have horrible allergies to dust and you could physically see lots of dust everywhere. The area of the hotel, great spot. No lock on bathroom door. Location! Clean white bedding! Loved it! I asked about the shuttle to the Benedum and the concierge just said, it's only 3 blocks and directed me to the exit. So I walked, in heels not meant for walking. There were bits of beard stubble in the sink and the toilet was not cleaned well around the outside bottom.